(Left) Brian Blackburn, Managing Director of Business Gateway Fife, and (right) Alistair Lang, President of St Andrews Business Club, welcomed Wynn Jones of Dunfermline-based Praetorian IT Security to The New Golf Club, St Andrews, for the second of the business club’s free business issues seminars. 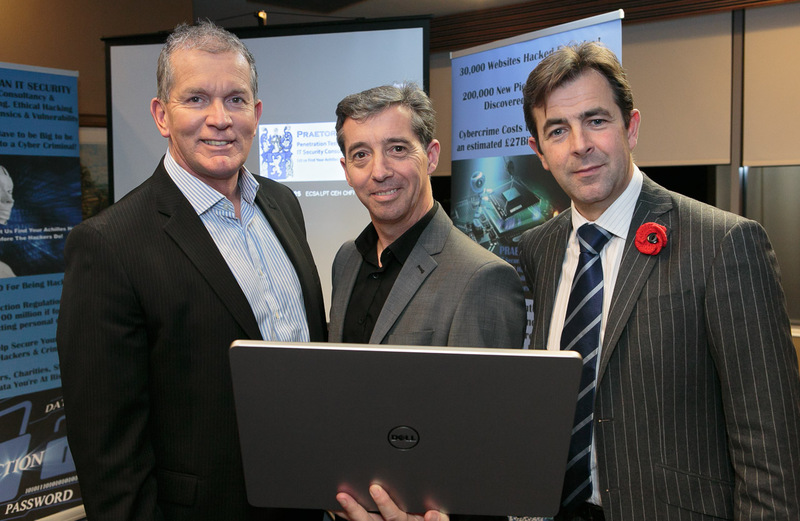 On 4th November 2015 Wynn Jones ECSA LPT CEH CHFI CCSA CVE CCA, of Praetorian IT Security ran a IT Security Seminar seminar at The New Golf Club, St Andrews. He spoke about some of the social engineering techniques and attack vectors used by the cyber-criminal fraternity and hackers of the world, to gain access to your computers, networks and websites. He also talked about the many and varied reasons behind their reasons for hacking, why over 30,000 websites per day are hacked and 200,000 new viruses are discovered every day. Wynn blew away the common misconceptions that the only thing hackers are interested in are credit card details, and top secret industry secrets. He advised on some of the best practices and tips for helping to protect the data you store and pass across the internet. Some of the most common and not so well-known attack vectors used by hackers. Hackivism! The multitude of reasons why people hack. Quick demonstrations of how easy it can be to setup a cyber-attack. Firewalls and Anti-Virus programs; The first things a hacker is taught to evade. Tips, tricks and solutions to help keep out generic attacks by cyber-criminals. Wynn Jones is a seasoned IT security professional with over 21 years’ experience in the IT industry. He has worked for and with a wide range of companies, everything from sole traders up to multi-national corporations like Experian and Lockheed Martin. Wynn now runs his own Fife based consultancy providing affordable IT security solutions for the SME.